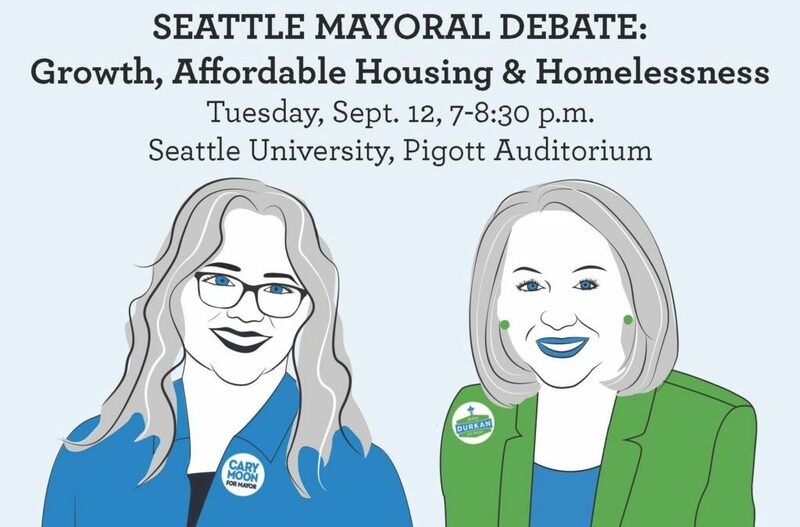 Join the two Mayoral candidate finalists, Jenny Durkan and Cary Moon, for a debate to shine a light on how Seattle’s next mayor would address our City’s most pressing issues: Growth, Affordable Housing & Homelessness. They’ve already completed a pre-primary questionnaire – now they are back for a deeper dive into their vision for Seattle. Debate co-sponsors include the Seattle University Project on Family Homelessness, the Housing Development Consortium, Seattle/King County Coalition on Homelessness (SKCCH) and Washington Housing Alliance Action Fund. KCTS 9’s Enrique Cerna will moderate, with questions from Crosscut‘s David Kroman and Heidi Groover of The Stranger. Questions may be emailed to communications@solid-ground.org with “Question for Mayoral Candidates” in the subject line.